Combine all brine ingredients in a saucepan, bring to a boil. Cool completely, refrigerate until ready for use. 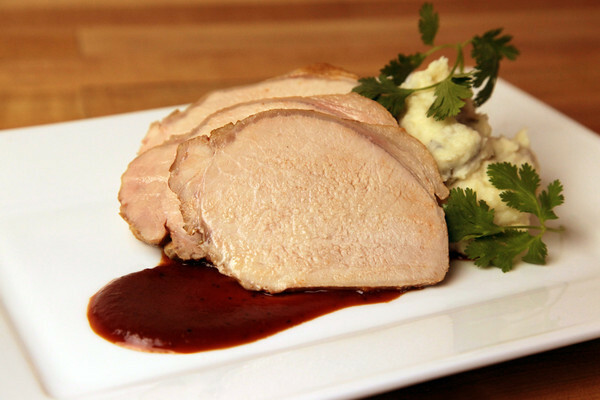 Place pork loin in brine and let sit, refrigerated, 12-18 hours. The longer the pork sits in the brine, the stronger the salt flavor will be, after cooking. Rinse brine from pork loin and vacuum seal with enough olive oil to coat liberally. Set the rear pump flow switch of the Sous Vide Professional™ to fully closed. Set the front flow switch to the maximum flow. Set the temperature of the Sous Vide Professional™ to 60°C / 140°F. Once target temperature is reached, place vacuum sealed pork loin in circulating water bath. Cook sous vide for about 2-3 hours. Drain all liquids from bag, dry surface of pork loin with clean kitchen towel. In a hot, large sauté or roasting pan, brown entire surface of pork loin. Season with salt and pepper to taste. 1,5% of salt in water equals: 1000 grams of water x 15/1000 = 15 grams of salt in 1 liter of water. This amount of salt looks reasonable for 12-18 hour brinning! Hmmm… still not quite right. 1.5% would be a tiny amount of salt. Do you mean a salt to water ratio of 1.5? By the way, is the ratio by weight or volume? Sorry for the mistake. The correct percentage should be 1.5% salt to water ratio.